I’m packing up and preparing my now complete ‘Alternative Tea Party’ painting, here’s a sneaky peek; note the dapper Mad Hatter! 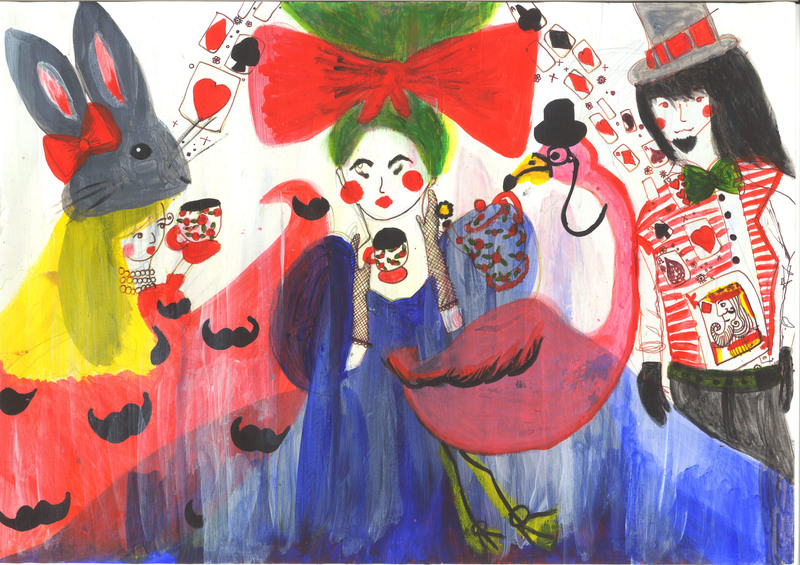 This painting was created using acrylic, ink and pastel and was inspired by Alice in Wonderland and the ‘Mad Hatter’s Tea Party’, a surreal fantasia. My fashion illustrations are always inspired by vintage dolls, to which I add a contemporary twist. My Alternative Tea Party, which was inspired by Tim Walker’s fashion photography, resulted in this concoction of curious and whimsical characters. This entry was posted in Uncategorized and tagged Art, Clifton Print Services, Dapper, exhibition, Fashion Illustration, Flamingo, Goswell Road, Hare, London, Mad Hatters Tea Party, Milk and Two, MissVDesigns, Old Street, opening, Painting, Playing Cards, Pop up Gallery, scan, Street Coffee, Surreal, Tea, Tea Party, Veronica Rowlands, Whimsical.